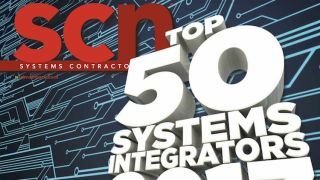 For more than 10 years, SCN has been compiling a list of the industry’s Top 50 Systems Integrators. It’s a great way for us to close out the year—and a way to glean greater insight into the industry. As my first year “on the job,” it’s particularly exciting for me to learn more about these companies, what they do, where they’re seeing growth, and where they think the industry is heading. Some of you have been waiting on the headline “Everybody Acquires Everybody” as we’ve had seemingly nonstop reporting on mergers and acquisitions. It’s been fun to do a deeper dive with some of these companies, and see where their heads are at when it comes to merging not only the business-side of things, but the people side of things (read about Diversified’s take on merging cultures here). The top five is practically identical to our 2016 list, with Ford AV coming in fifth and CCS Presentation Systems moving into the sixth slot. The biggest jump was Genesis Integration, which flew from 49 all the way up to number 20. Also improving significantly were IES Commercial, which jumped a whopping 17 places, from 39 to 22; Solotech, making the top 10 after landing at 18 last year; and Carousel Industries, taking over the 18 spot after checking in at number 25 last year. Other highlights include newcomers to the list, SKC Communications, coming in at 14, and SIGNET Electronic Systems, which just barely missed the list the last three years, finally making the cut at number 50. Commercial installation projected revenue experienced a big jump in the past year. In 2016, AVI-SPL, who was top of the list, projected a revenue of $605 million. In 2017? $720 million. Diversified, second on the list, will go from $410 million to $600 million. These increases, however, come as no surprise, with both firms completing some major acquisitions. Nevertheless, the industry as a whole has grown considerably from last year, with a projected $4.27 billion in commercial AV installation revenue. That’s an increase of about 12 percent year-over-year from last year’s projections of $3.82. Not too shabby. It’s important to note that all Top 50 submissions are voluntary. Our information comes directly from integration firms who are willing to share their internal numbers. With this industry snapshot, we can begin to put together the different pieces of the puzzle and see a fuller picture. While numbers aren’t everything, they certainly give us a good idea of what’s going on in our industry today, and where we can strive to be tomorrow. Click here to read the full list.